The Christmas Lite Show is Michigan’s largest Christmas light show. We built their Shopify-powered website and full-stack digital marketing strategy. The Christmas Lite Show is Michigan’s largest Christmas light show. The Christmas Lite Show uses more than 40 animated displays that stretch almost two miles. Now in its 20th year, the Christmas Lite Show approached our team, in collaboration with Northbound Studios, to tackle all design, marketing, development, and PR efforts. We knew this was going to be a fun project due to the nature of the beast. Who wouldn’t love working with a client whose purpose is to spread the holiday cheer? Our main objective was to make sure that all the work we did together was purposeful and intentional in creating an unforgettable experience for the attendees of the events. By creating phenomenal experiences, you create loyal, brand ambassadors that help spread the word about your awesome brand, event, and experience. The most alarming thing (to us, but we’re digital marketing nerds) was that after 20 years, they did not have any customer emails. I’m not sure what you know about digital marketing, but that’s a big problem. Not simply to resell to past customers (and email marketing is the most effective to do so), but that list can help you create a Facebook lookalike audience, which helps you identify people that are qualified to buy your product/service based on similar qualities/interests Facebook finds from your email list. We knew the Christmas Lite Show would be better served if they had a large email list to work with, but creating one from nothing wasn’t going to be easy… Or was it? Together with the Christmas Lite Show team, we created “The Golden Ticket Giveaway” which would give one lucky family the opportunity to experience the Christmas Lite Show absolutely free for the rest of their lives. We created highly targeted Facebook ads to get people to sign up for a chance to win the Golden Ticket, just by giving us their name and email. With a new Shopify-powered website that allowed visitors to buy tickets on the website (so we can easily measure ROI of ad spend), we’ve already sold over $10,000 worth of pre-event ticket sales. In the past, there was $0. 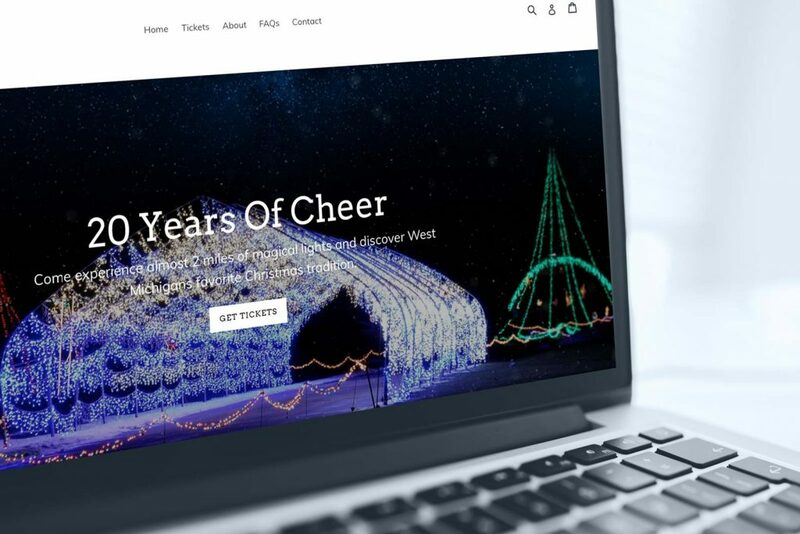 Using Shopify as a platform to sell tickets vs. other popular platforms like Event Brite allows the Christmas Lite Show to retain more profit and for digital marketers like us, it allows us to determine the average cost to acquire a new customer. An Event Brite solution would cost $.99 per ticket sold plus 2.5% of the ticket value. But there’s no way you have all the same features as Event Brite! Well, we do. Automatic ticket delivery via email, simple passbook integration, scheduled and variant ticket types, you name it, we can handle it. We’re still, at the time of writing, working the digital marketing strategy for the Christmas Lite Show, but we’ve got a cost per conversion into a new or potential customer at $0.17 per person. We’re estimating conservatively that those emails are worth $100/person for a lifetime on average, which means we’re doing really well. But, it helps when you’ve got an awesome experience like going through 2 miles and over 2 million Christmas lights. Update December 2nd: One email was sent to the email list of 5,000 local, interested attendees that we generated in less than 30 days and it generated just over $2,000 within 12 hours.